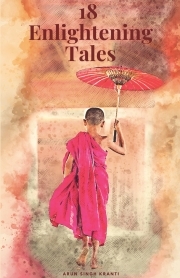 18 Enlightening Tales is a collection of 18 real life stories from the author. Through these stories, the author has brought forth as to what "Spiritual/Religion" is all about. Each story differ from the other and so as the message. The flow was simple and structured. Each of them conveys the message which the author was seeking prior. Author emphasize on reading them over and over again to grasp the real meaning of these stories. The references were simply beautiful. Though there is a mention of Hindu Gods in the story, I would say that this would fit for people who belong to various faith and for those who do not believe in GOD, there is a story for you as well. A clear explanation given in each and every story, most of them by the author's Guru makes this book an interesting read. Though it wouldn't take more than an hour to finish this book, at a stretch, I would recommend to read one story a day and these can be used as a perfect bed time story for your kids as well. The book would surely let you understand the real YOU!! The book is available on Pothi and Amazon.